A beautiful July evening and a successful quarter-end close presented the perfect opportunity to get out of the office and onto the water. 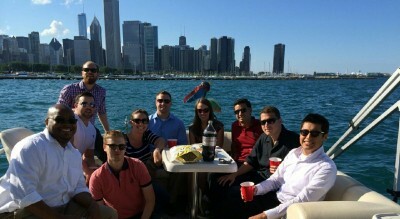 Members of the Accounting and Finance teams at HUB International joined TGG aboard “The Polynesian” for some refreshments, stories, and a great view of the Chicago skyline. With Captain Tom at the helm, the only worry was whose iPhone was going to provide the tunes. It looks like we might have a new tradition for our visits to Chicago… at least for our summer visits!